Those words spoken by the late Prime Minister David Thompson one night on the CBC were nothing but the truth. Folks were aghast that he said the words – but at the same time seemed unconcerned about the truth of his statement. How like us that is: we’re concerned about the image, not with the reality of our society’s faults. We are NOT an enforcement society. It shows in the trash on the streets, in the number of people and businesses that fail to pay taxes for years (sometimes decades) without penalties and when people steal millions from the public purse and never a charge is laid. And it shows in the number of fatal accidents on our roads. Tourists from the UK have a 240% greater chance of dying in a road accident in Barbados than back at home. We lose more people to road deaths than to murder, but we don’t have effective laws against drinking and driving. Our Royal Barbados Police Force is 100 officers under strength because we pay Constables less than we pay our garbage workers. And so another young man died on Thursday morning. Tito Michael Anderson Bradshaw of Wilkinson Road, Richmond Gap, St. Michael, died at about 8:40am at 1st Avenue Weekes Land near Goodland, St. Michael. 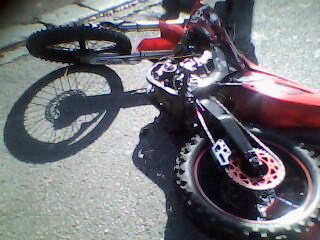 He lost control of his motorcycle and his head hit a pole. A crowd gathered. His mum was brought to the scene and the poor woman lost it right there and it’s no wonder. But in a short while the body was removed and the blood and brains on the road were hosed down. After the sun dried everything up, it was like nothing had ever happened. No tourists would be alarmed. No locals would be concerned when passing by the site. Whether it’s crime or road accidents, our police are excellent at cleaning up – just not so good at prevention. And who can blame them when the politicians stage cricket parties and celebratory evenings but won’t pass the laws that the police need to protect us all. The photos are grim, gruesome even – but we’re going to show them here in full because they might save another young man’s life. Our thanks to BFP reader ‘What will they think of next’. The death toll is now two from Tuesday’s head-on collision between two large trucks on St. Luke’s Road, St. George. 17-year-old *Roosi Straughn, who died at the scene, was one of seven passengers carried illegally in the open back of one of the trucks. Yesterday the driver of the that vehicle, Ervine Barker, died of his injuries at Queen Elizabeth Hospital. Our hearts go out to the family and friends of Roosi and Ervine. We hope they will find peace and also fondly remember the precious time they had with their loved ones. When we lose friends suddenly like this we are all reminded that a person never knows the day or the hour when they might be called home, so we should enjoy each moment and do our best in everything while we can. Transport Minister Boyce promises a safe crossing, but how many more will die before it’s built? On Sunday July 11, 2010, Errol Briggs was struck by an auto and killed as he tried to cross Spring Garden Highway from the beach. Many will agree with us that he died because like thousands of his fellow citizens every week, Briggs was forced to play Russian roulette on the highway – just for a sea bath. Errol Briggs died because for the last 20 years successive governments have been walling off access to the sea for ordinary Bajans. Whether faced with a wall of condos or a dangerous highway, the result is the same for citizens and visitors who want to enjoy the beach. How many more have to die before Barbados gets modern breathalyzer laws? Mass casualty accidents are bound to happen and with big wide buses on our narrow roads we seem to have more than our share of public transit accidents. What never changes is the fact that successive BLP and DLP governments have promised but never acted to provide modern anti-drunk driving laws and breathalyzer testing for drivers suspected of drinking. Every year more people are killed in road accidents in Barbados than are murdered, yet successive BLP and DLP governments refuse to implement breathalyser equipment and modern laws to protect people from drunk drivers. The first job of government is to protect the citizens, and successive BLP and DLP governments have failed to protect the citizens when it comes to people who drink and drive. 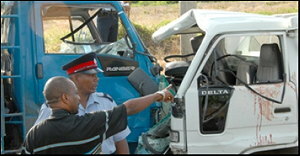 Six dead at the Joes River tour bus crash, four more dead in the Emancipation Day crash and others. But in these and other serious crashes since, aside from an autopsy, Barbados Police have no way of proving how much an involved driver has been drinking. That is because our government has been negligent in providing the legal structure and the equipment that the police need to protect us all. Can MP Michael Carrington lead the way? Will the Health & Transport Ministers join him? 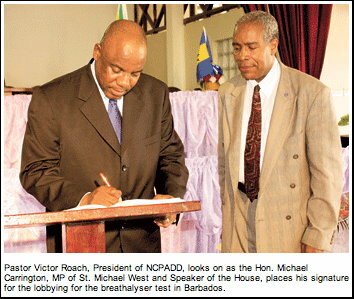 We see in today’s Barbados Advocate that Speaker of the House and MP for St. Michael West signed a petition calling for the government to enact breathalyser laws. Signing was an excellent gesture by Mr. Carrington and we hope that he continues to push for his government to finally do something about the carnage on our roads. His next step should perhaps be to speak with Health Minister Donville Innis who exhibited a definite “take it or leave it – not really interested” attitude to breathalyser laws when Mr. Innis last talked with Barbados Free Press about the subject in December of 2009. I don’t know why this should be so difficult because breathalysers will save lives, and both the law and the technology are relatively cheap, quick and easy to implement. It’s not like we have to invent anything or do much more than copy and paste laws from other countries with a little tweaking for our culture and court system. What is our road tax being spent on? Certainly not de-bushing roads! 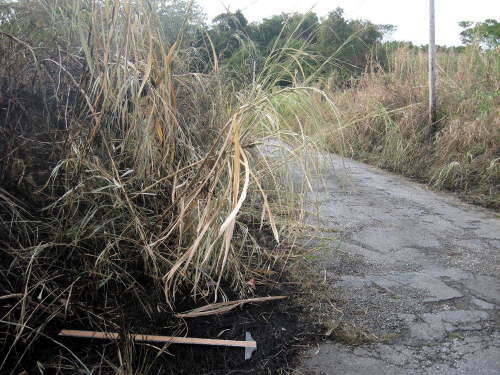 These are photographs of the public road between Fisher Pond, St. Thomas and Sugar Hill, St. Joseph. 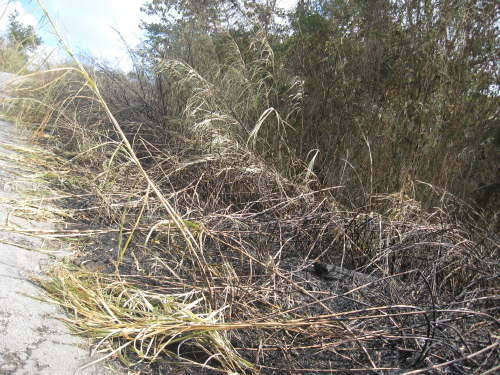 It shows the aftermath of the 5th fire for the year in this area which occurred on February 17th. ( the first occurring on January 1st ) . Check with Arch Hall Fire Station. Note the ruler at bottom of two of the photographs. This measures three ( 3 ) feet, ten ( 10 ) inches, so just under four feet. It is obvious how far the bush has been ‘allowed ‘ to encroach into the road way. Two cars cannot pass. Many calls have been made to the relevant government departments about this stretch of road. Further along is The Rusher ( mistakenly called Russia ) gulley. 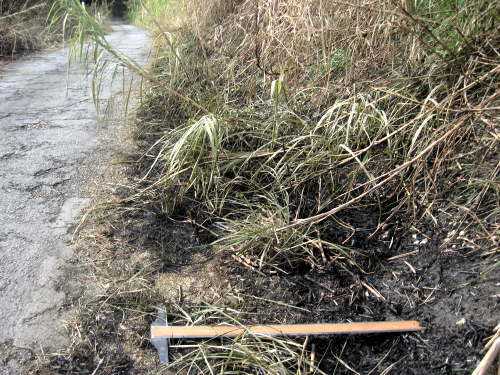 Approximately three weeks ago a crew cleared ‘ some ‘ of the bush ONLY at the south entrance. It is still there and now has the wild cane growing up on top of it, making the entrance smaller than it was before the bush was cut. Interesting isn’t it? What is our Road Tax money being spent on?